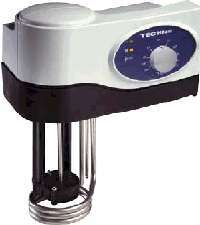 Inventors of the "Clip On" thermoregulator in 1948, TechneÂ® now offers five "Clip On" units. These Thermoregulators will convert your existing liquid bath or container into a precision temperature controlled bath with exceptional thermal performance. They offer a full range of options such as analog or digital set/readout, high pump output and RS232 interface. The TE10D Tempunit offers a temperature range capability of between -40Â°C to +120Â°C. There is a digital temperature selector, circulating pump with external circulation connections, adjustable over-temperature cut-out and low liquid level cut-out. The TU20D has a temperature range capability of -40Â°C to +200Â°C and incorporates the additional feature of an RS232 port. The top of the range TU20C has additional features fitted as standard including an audible alarm, a high capacity dual pressure pump, cooling coil and also includes an RS232 port. The temperature range capability is -40Â°C to +250Â°C. The TU20HT is designed for internally circulated baths, thus it is not capable of external pumping for re-circulation, but does include the cooling coil, Thermsoft software and has an operating temperature range capability of -40 to +250Â°C. For applications that require sub-ambient operation, see our refrigeration units for use in combination with the unheated baths or one of the refrigerated baths for an integrated system. Download the full version of ThermSoft software. It allows you to create ramp and dwell programs and remotely control the TU20D, TU20C and TU20HT from your PC . Thermsoft is included with the TU20C and TU20HT and is a free download for the TU20D.